You will receive 7 separate MP3 files. A total playing time of over 1 hour. The Root Chakra Guided Meditation is 8:15 minutes in length. 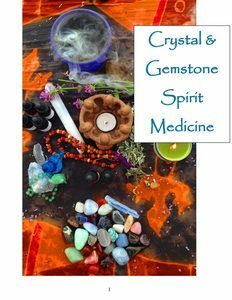 As the Chakra of the physical body and Earthly incarnation, all fears and issues connected to safety and being grounded reside here. The musical instrument associated with balancing, harmonizing, and clearing the Root Chakra is the drum. You will hear the drum and nature sounds in this guided meditation. 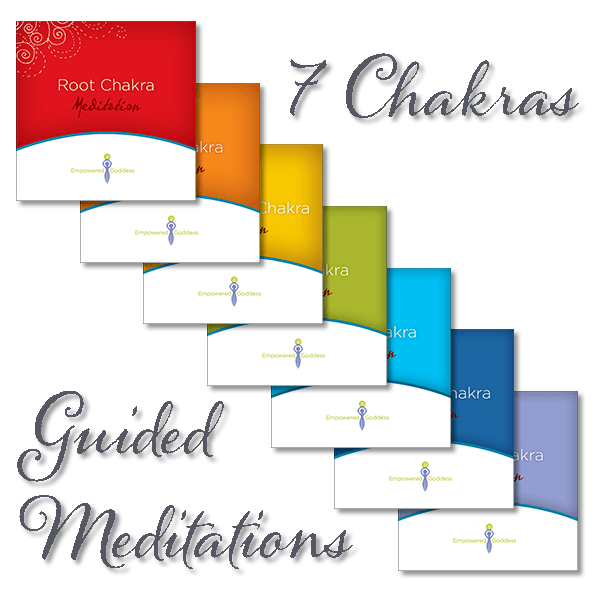 The Root Chakra Guided Meditation facilitates healing, deep clearing, energetic harmony, and balancing of the Root Chakra and your physical body. 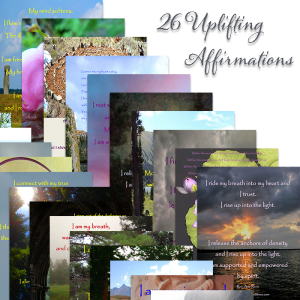 This meditation is extremely grounding and nurturing. The Root Chakra meditation makes a great healing tool for anyone who struggles with feeling scattered or has difficulty being present. The Sacral Chakra Guided Meditation is 8:42 minutes in length. This Chakra governs gut level intuition and the emotional body. Our deepest passions, joys, and creativity–or lack of–reside within the Sacral Chakra. The musical instruments associated with this Chakra are the woodwinds. You will hear the flute and water sounds during this guided meditation. The Sacral Chakra Guided Meditation facilitates healing, deep clearing, energetic harmony, and balancing of the Sacral Chakra and the emotional body. This meditation also soothes emotional stress and is deeply restorative. Listening to the Sacral Chakra guided meditation supports and deepens your intuitive connection. This relaxing guided meditation also deepens your connection to, and understanding of, your emotions. The Solar Plexus Chakra Guided Meditation is 8:22 minutes in length. Lessons with regard to power, intellect, and wisdom reside here as the Solar Plexus Chakra governs boundary issues and the mental body. The musical instrument associated with the Solar Plexus Chakra is the pipe organ. You will hear the organ and a crackling fire during this meditation. The Solar Plexus Chakra Guided Meditation facilitates healing, deep clearing, energetic harmony, and balancing of the Solar Plexus Chakra and the mental body. This meditation relaxes mental tension and anxiety. When used regularly, the Solar Plexus Chakra guided meditation may also help reduce negative thinking and spinning thoughts. The Heart Chakra Guided Meditation is 9:04 minutes in length. The Heart Chakra governs lessons of love, acceptance, giving, and receiving. This energy center also has a great influence over one’s creative abundance and trust. The musical instrument associated with the Heart Chakra is the harp. You will hear the harp and blowing wind during this meditation. The Heart Chakra Guided Meditation facilitates healing, deep clearing, energetic harmony, and balancing of the Heart Chakra. This meditation is also a great wounded heart healing ally and may even help elevate broken-heart related grief. The Throat Chakra Guided Meditation is 7:06 minutes in length. The Throat Chakra governs lessons with regard to expression, communication, impeccability, integrity, and higher levels of manifestation. The musical instruments associated with the Throat Chakra are brass. You will hear horns during this meditation. The Throat Chakra Guided Meditation facilitates healing, deep clearing, energetic harmony, and balancing of the Throat Chakra. This meditation is soothing and empowering. The Throat Chakra meditation is a great support for anyone who feels they have lost their voice or can’t say “no”. Used regularly, the Throat Chakra meditation also facilitates a connection with, and understanding of, your life path and purpose. The Third Eye Chakra Guided Mediation is 9:01 minutes in length. The Third Eye Chaka governs your higher senses and higher level of intuition. Lessons with regard to enlightenment also reside here. The musical instrument associated with the Third Eye Chakra is the piano. You will hear the piano during this meditation. The Third Eye Chakra Guided Meditation facilitates healing, deep clearing, energetic harmony, and balancing of the Third Eye Chakra. This meditation is energetically harmonizing and deeply relaxing. The Third Eye Chakra meditation supports an opening up of your clairsenses and therefore intuitive clarity. The Crown Chakra Guided Meditation is 7:41 minutes in length. The Crown Chaka governs spiritual truth and discernment. This is the Chakra of open connection to Divine knowledge. The musical instruments associated with the Crown Chakra are the strings. You will hear the sound of cosmic strings during this meditation. 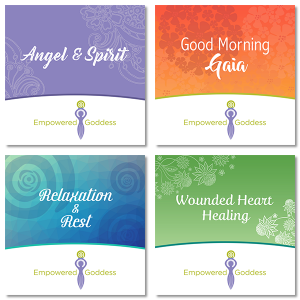 The Crown Chakra Guided Meditation facilitates healing, deep clearing, energetic harmony, and balancing of the Crown Chakra. This meditation also helps clear and open your Center Channel, creating a connection that allows you to receive direct communication and informational downloads from the upper realms.